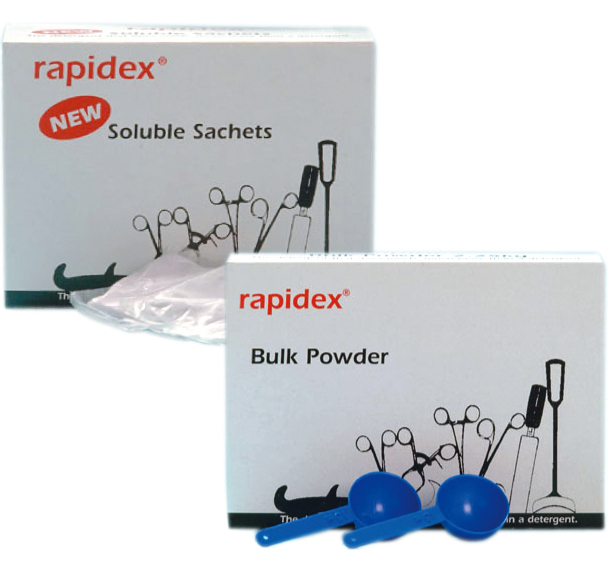 Rapidex is used where there is a need to clean medical instruments and other equipment prior to sterilisation. And when added to any Ultrasonic Cleaner, it will make the cleaning process safe & effective, especially when cleaning surgical instruments. Rapidex will remove all manner of dirt to ensure your items are thoroughly clean. A solution of either Rapidex or Rapizyme will clean awkward bends, niches or tapers along with all the other the difficult to clean areas. Rapidex is used throughout the world in Hospitals, Dentists, Doctors surgeries, Veterinary practices, podiatrists, laboratories, industry, tattoo and body piercing because it removes stains and dried matter such as ink or blood.